Amongst the published articles on the site, it seems there is a fair amount of interest in the ones dealing with “compatible” and “fake” camera accessories, specifically Nikon EN-EL14 and EN-EL14a batteries. Having just recently returned from my first extended holiday, and now armed with the B&K Precision Model 8600 DC Electronic Load, I thought it would be a good idea to see just what the capacity of my genuine and compatible surviving EN-EL14/a series batteries were, just to see if it is even worth bringing them with me. After all, luggage allowances are like gold. I rounded up all of my surviving EN-EL14/a series batteries of which there were five. Two of the batteries are genuine batteries as supplied with a Nikon D3200 and D3300 body. The remainder were “compatible” aftermarket batteries. Their characteristics are noted in the table below along with their weights. Specifically, the compatible EN-EL14a is identical to this prior teardown of a failed unit. The first compatible EN-EL14 is the surviving “brother” of this failed unit. The second EN-EL14 has not yet otherwise featured on the site. Unfortunately, no living samples of this particular variant were available. 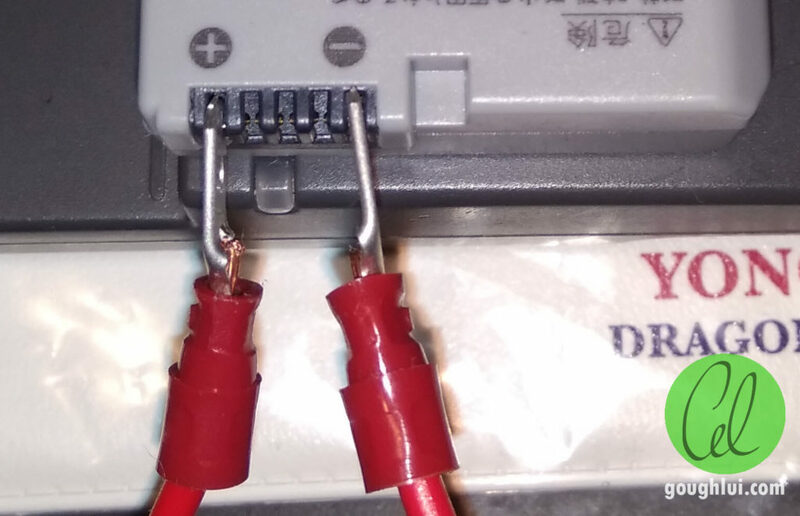 The batteries were connected to the tester using a short length of AWG18 wire and a spade crimp which was “compressed” using the crimp tool as to fit within genuine Nikon battery sockets. It was noted that this was not necessary for the counterfeit batteries, which had wider terminals that could accommodate the spade terminal without modification. The “compatible” battery is on the left, with a genuine battery on the right. The wider terminal shroud seems to be a common factor amongst all compatible batteries tested to date. Regardless, testing using such spade terminals is not recommended for end users as they risk causing contact fatigue or damage to the plating, as it was not designed for mating with the terminal block. I decided the risk was worth the reward (for me), and have completed the testing this way with no ill effect. However, if you choose to replicate this set-up, you do so at your own risk. Testing was simplified to a 300mA constant current load, despite the camera load profile being more “peaky” in nature due to the mechanical nature of a DSLR. The obtained results may not perfectly reflect the true “in-service” capacity of the battery as a result, especially if live view or the pop-up flash are used. The loading was chosen as a “safe” value below the (anticipated) 1C rating of the worst battery which should not cause any dangerous situations to arise. Test termination voltage was set to 5V for 2.5V per cell as to reduce the risk of any permanent cell damage. As the batteries are not obtained new and are actually significantly aged, the results are not representative of fresh batteries. Of note is that failed samples of the compatible batteries have been excluded by the nature of their failure, and thus one cannot infer the reliability of the batteries from the fact that a certain capacity remains after a number of years of use. If you haven’t read the methodology section, please do so to ensure you are aware of the caveats of the testing involved and significance of the results. A summary of the results is presented in the table above. Both Nikon genuine batteries achieved just above 90% of their claimed mAh capacity, with above 88% of their claimed energy capacity. 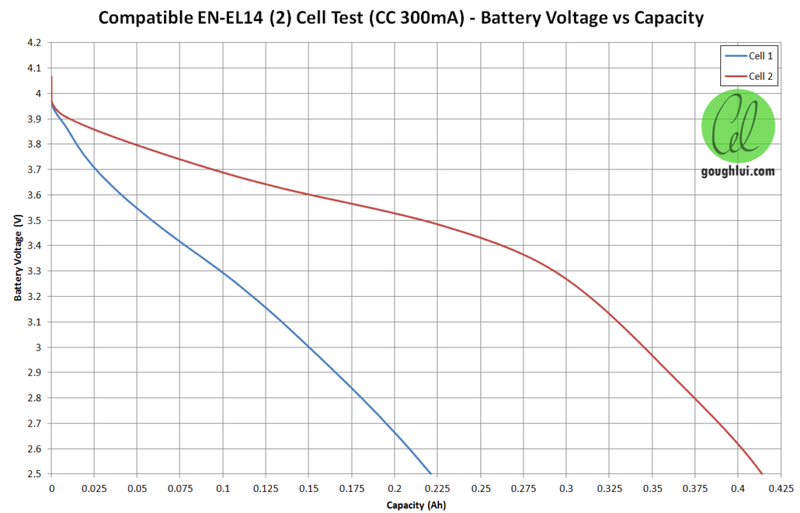 As a result, the EN-EL14 achieved 930mAh and the EN-EL14a achieved 1116.9mAh which are fairly good results considering their age of 4.5 and 2 years respectively. The compatible cells varied somewhat. 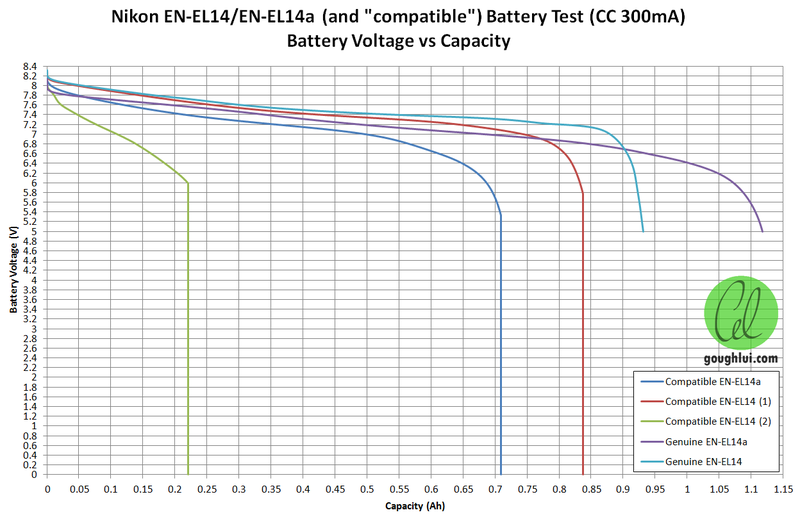 The compatible EN-EL14a which should boast a greater capacity than the older EN-EL14 reported a result of 709.7mAh which is 57.7% of the claimed capacity. 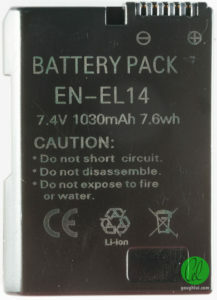 The first compatible EN-EL14 bested this by offering 837.3mAh which is within 100mAh of the result of the genuine cell. However, it boasts an inflated capacity claim on the unit, as such can only achieve 59.8% of its claimed capacity. In terms of energy capacity, it achieved 59.7% of its inflated energy capacity claim. The second compatible EN-EL14 only had 220.8mAh capacity in this test, just 21.4% of its claimed mAh capacity. It fared no better in the energy department with 20.2% of its claim. This battery appears to be showing signs of impending failure, which was observed to be gross cell capacity imbalance in previous failures. Looking at the voltage trends, most of the batteries (with the exception of the final one) show a reasonably traditional Li-Ion discharge characteristic. The results had some noteworthy characteristics. Neither of the genuine Nikon batteries cut-out at 5V, and instead, the test software stopped the testing as the voltage was at 5V during discharge. This implies the cell protection cut-off voltage threshold of genuine cells are likely to be less than 2.5V per cell to maximise capacity and reduce the risk of inadvertent power-down during a card write and may put more onus on the camera software to finish its tasks before battery depletion and prevent user operations to prevent stress to the battery. The other compatible batteries “dropped out” at voltages above 5V, although the threshold is not constant which implies one of the two cells in the battery have hit their minimum voltage and the battery is “disconnected” to protect the cell from damage. This behaviour could (in the worst case) result in removal of power to the camera in an unexpected way. The failing battery seems to have a discharge curve that is just linear, which appears unusual but may indicate internal resistance issues along with cell capacity imbalance. This battery is almost worthless to me, and thus, it now participates in a teardown in the name of science. 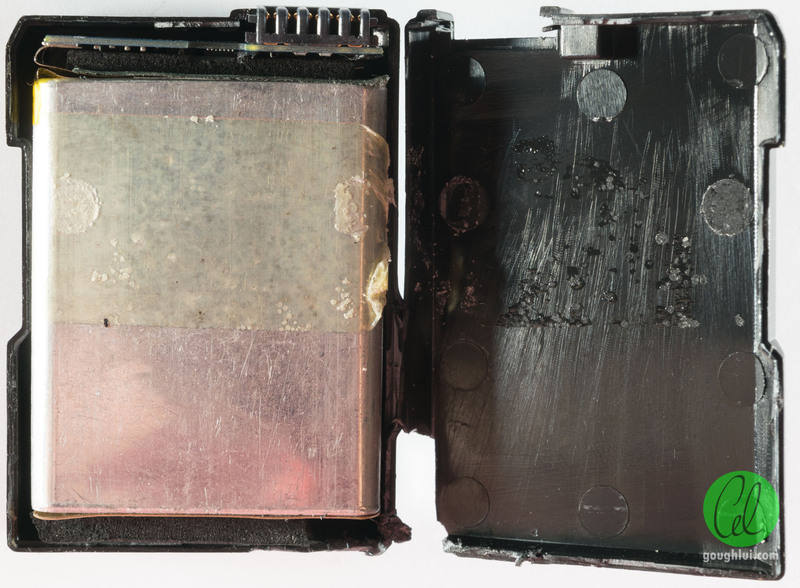 This “failing” specimen is black in colour with laser-etched text on one side and the top near the battery terminal. No other distinguishing features appear on the casing. It is very well sealed, and opening it required snipping at the case with side-cutters. Inside, double-sided adhesive tape and foam rubber strips are used to position the cells. The cells are unmarked. 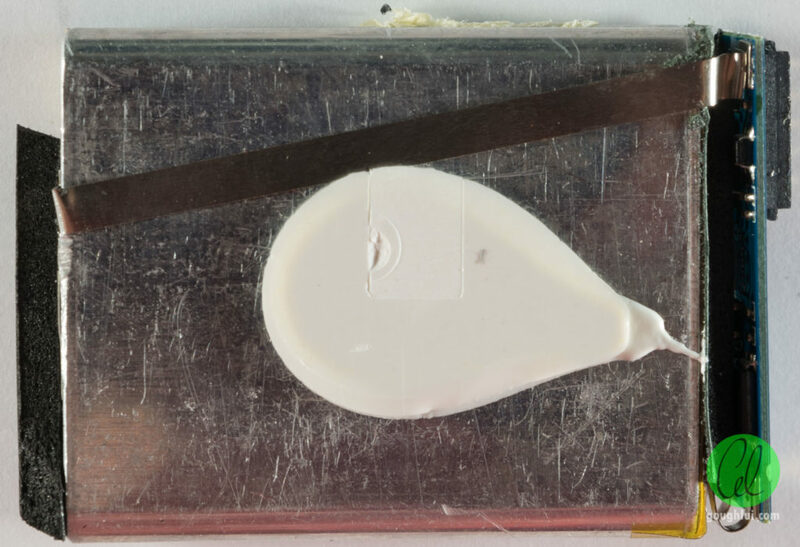 On the reverse, white silicone adhesive is used to secure the battery to its shell. As is common with other clones, the mid-point cell connection is provided for cell balancing. 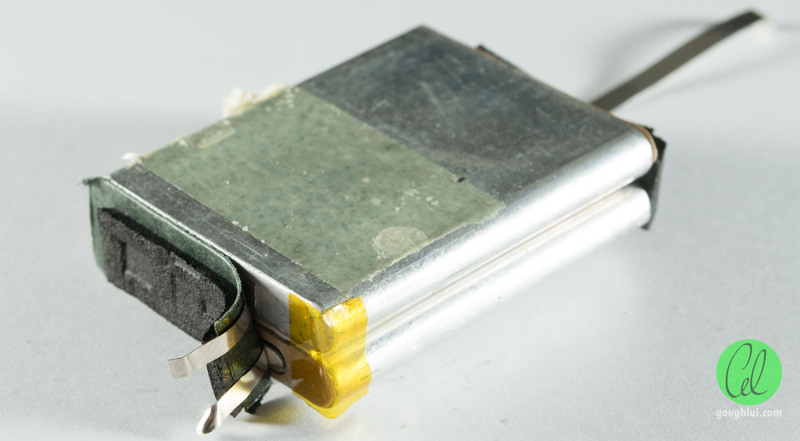 The board proves to be identical to this earlier failed compatible battery, with the same markings but different cells used. 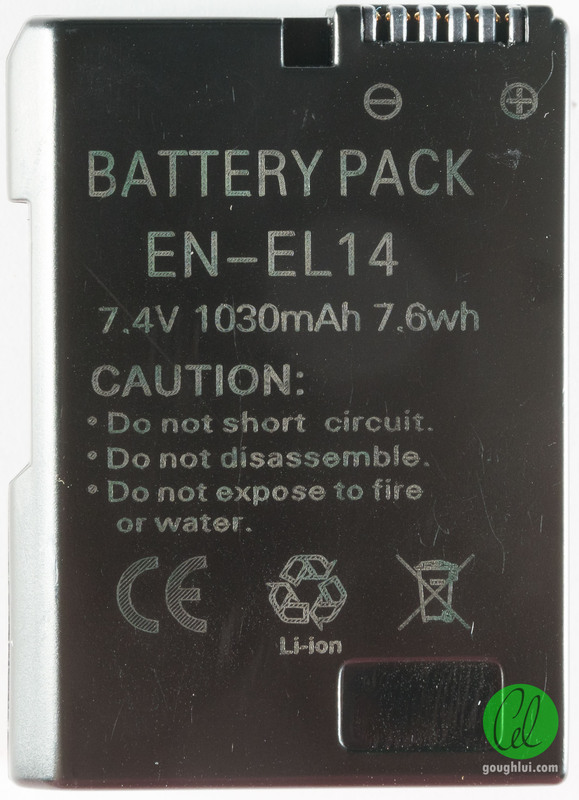 As I was curious as to the state of the batteries, I charged this EN-EL14 to full. This took a normal amount of time (~2hrs) despite its reduced capacity, potentially because the BMS is balancing the cells at the top of charge or due to internal resistance issues. I then repeated the CC 300mA discharge, but addressing each cell individually with a cut-off of 2.5V. A gross capacity imbalance is seen with one cell registering almost twice the capacity of the other under the same test condition. This suggests that Cell 1 was limiting the battery capacity. But even more significant is the shape of the graph that does not have a traditional sharp “drop” at the end of discharge. While the discharge terminated at an on-load voltage of 2.5V, after 12 hours unloaded, the voltage rose to 3.6V for Cell 1 and 3.7V for Cell 2. I suspect this is proof that the battery may indeed have more capacity but cannot deliver it at the requested current due to internal resistance. This is relevant, as one observation I have made is that the compatible cells rarely achieve the same level of performance in live view mode, which is demanding current-wise. Engaging live-view for non-trivial amounts of time quickly shows the low-battery indication more quickly than would be suggested by the capacity figures alone. Compatible batteries have been a bit of a mixed bag especially recently. They seem to feature inflated ratings at times, but almost all are now built with low quality domestically produced Li-Ion cells which result in gross cell imbalances and battery failures within a relatively short time. The ones that have not failed still do not match the genuine cells nor meet their ratings by any stretch, however, may not be completely worthless. Unfortunately, this is not a simple pickle to resolve as the cost of compatible batteries is much lower than the genuine batteries and for most people, do not cause any damage and come with only a small level of risk. Unfortunately, if you end up with a bad batch, replacing them time and time again, queueing them for charge and waiting, along with the increase in bulk carried is also a “cost”. To date, while the clones haven’t cost me any photos, they have limited live-view video opportunities and occasionally caused a shutter error to appear (which is resolved by pressing the shutter button again). I suspect this is because of internal resistance issues resulting in a voltage “dip”. Genuine batteries are not that easy to come by, and can be difficult to differentiate as well. 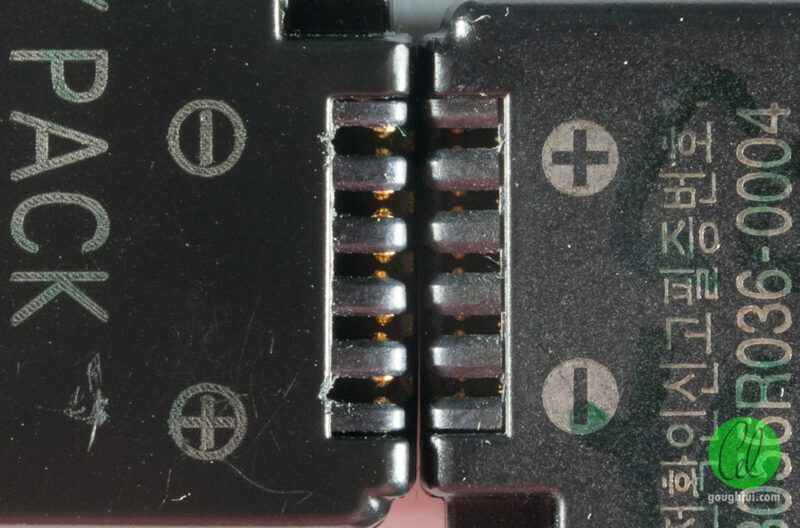 That being said, it seems all compatible EN-EL14/a batteries have wider terminal shroud spacing and cut-off before 5V under load, thus could be simple characteristics to differentiate “counterfeit” batteries from genuine ones. Regardless, a compatible battery in the process of failure was torn down and examined – which brings the number of different EN-EL14/a batteries torn down to four different types with two families of PCBs. This entry was posted in Electronics, Photography and tagged analysis, battery, fail, failed, fake, made-in-china, number crunching, photography, teardown, tested. Bookmark the permalink.